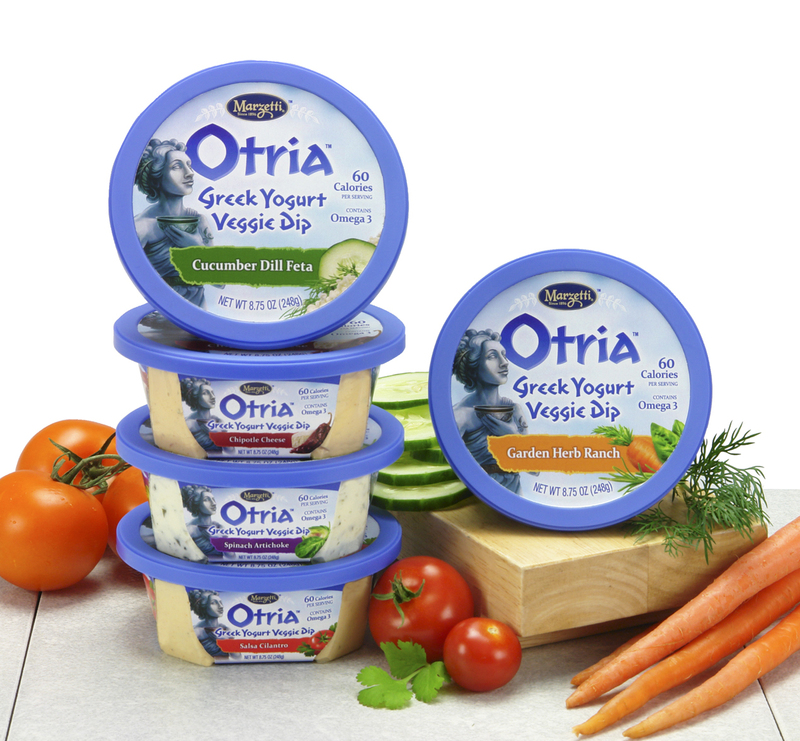 We interrupt this regularly scheduled holiday break with a word from our sponsors: Marzetti Otria Greek Yogurt Veggie Dips! It is almost New Year’s Eve and my guess is that many of you will scramble around the house this weekend looking for a quick and easy appetizer to bring to your New Year’s Eve party. Typically, I am a make (at least partially) from scratch kind of girl but sometimes, let’s face it, we don’t have time (or energy). We recently had the opportunity to taste a few of the Marzetti Otria Greek Yogurt Veggie Dips and they are the perfect quick and easy fix. These lower calorie dip options can be found in the refrigerated area of the produce section of your grocery store (amongst refrigerated salad dressings, etc.) There are five delicious options: Cucumber Dill, Spinach Artichoke, Salsa Cilantro, Chipolte Cheese and Garden Herb Ranch. Greek yogurt has been all the rage in 2011 and I don’t think the trend is going to stop any time soon and why should it? Greek yogurt provides that thick, creamy texture you would normally get out of sour cream or mayo without all the extra fat. I tried three out of the five flavors and sampled them each in different ways. The winner for me has to go to the Cucumber Dill dip. Maybe it is because it reminds me of summer or my short trip to Greece a few years ago, but I loved the cool taste of the cucumber combined with the not too strong dill flavor. I spread the Cucumber Dill dip on a pita and topped it with sliced grape tomatoes, sliced kalamata olives and chopped cucumbers. This made for a different and delicious easy lunch, but would also work as an appetizer. You could also substitute the Cucumber Dill Veggie Dip for the cream cheese base on a veggie pizza. I tasted the Spinach Artichoke with some garlic pita chips and veggies. I preferred the dip with the chips, maybe I just like some extra salt. The dip has a great texture and leaves you feeling much lighter after you eat it than your typical spinach artichoke dip. Lincoln loved it with the pita chips (veggies, hoorah)! Last, I tried the Salsa Cilantro. I know cilantro can be an acquired taste for some, but this dip has just a touch of cilantro and a hint of southwest. It was great as a straight veggie dip and also good spread on a tortilla with some black bean and corn salsa. These dips would be great served side by side with a lovely array of colorful veggies or separate and highlighted in their own ways, like some of the quick recipes I have described. However you decide to serve them, I think you will be pleased with the reactions of your guests. So focus more on your glittery ensemble or fabulous cocktail this New Year’s Eve instead of your bring along appetizer, because Marzetti Otria Greek Yogurt Veggie Dip has it covered. HAP was one of the blogs selected by T. Marzetti Company and Clever Girls Collective to host a Marzetti Otria Greek Yogurt Veggie Dip review. They provided us with product to test and compensation for our time. However, our opinions are entirely our own.